Bicycle Racing on a Budget: The last race of 2013. 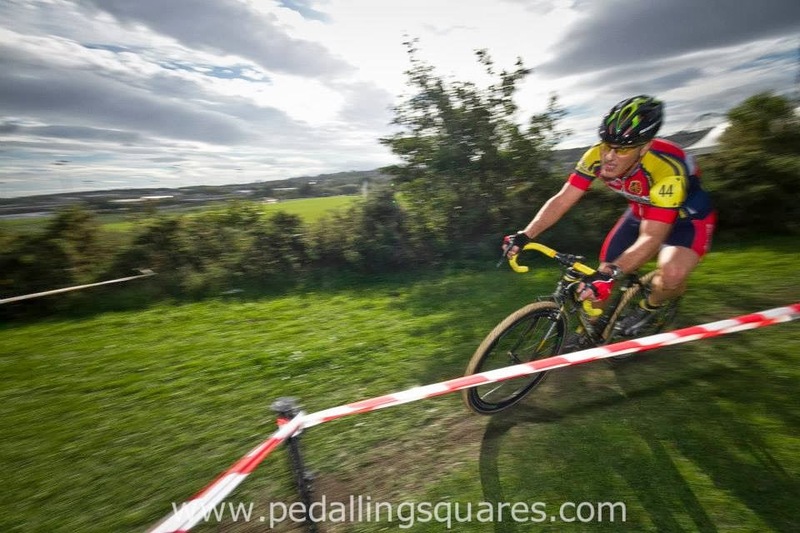 Today on Boxing day I rode the last race of the year, CXNE cyclo cross at South Shields. I gained a solid 7th place and I rode quite well, but once again I was distanced quite easily by the top dogs. The course was set up slightly differently with more camber that was bound to rut up and become difficult as the race went on. Ran mostly on grass that was frozen on the surface, it broke through into wet mud in places, which again would become worse as the race went on. I was quite pleased with my tyre pressure selection and had plenty of grip until that last few laps. Start of the second lap at CXNE South Shields. The start was good for me and I managed to tag onto the back of the fast guys in 7th place at the end of the straight. That's the closet I got to them as the they steadily pulled away. I could feel someone on my shoulder but as I started the second lap I was on my own chasing shadows and that's basically what happened for the rest of the race. I told myself I was leading to motivate me and to keep the pace up, and I could see that a Cumbrian rider and Steve Smales from the CXMagazine.com team were closing on me at about 10-15 seconds. A few mistakes on the cambers and a big effort from behind meant that the Beacon Wheelers rider was within 5 seconds with half a lap to go. I put some big digs in on the muddier sections and I knew he would not catch me, but he fell on a dropping left hander as I was riding back up after a hairpin turn and I knew I had 7th in the bag. I was a bit goosed at the finish with those usual mixed emotions of being pleased, but disappointed with conceding so much time. We have some very good vets up here in the North East, 4 at least in the top 30 of the national rankings and good couple of juniors as well. Trying to stay with them is hard work and I put much of it down to being a good 7-10kg overweight. Until I shift that lard, I ain't going to be competitive. So there we are, 2013 draws to a close and I've managed to put in a full season, time trialling, few road races and my first cross season for 20 years. Fours win on the score-sheet, and numerous top 10 finishes. I should be pleased, but 2014 looks like a lean year and I need to secure some work and income to ensure a comfortable and stress free living and racing. Access to funds is going to be limited and it's going to be a one big year as a budget racer! Ripley Cross on New Years day.